Bit of a Slog We decided before the start that the spinnaker was a no go so hoisted the #1genoa to go with the full main for the beamish reach to Warner. We had a good start and for some time led the class 5 fleet down the Eastern Solent. A few tried spinnakers and caused much mirth on our boat as they broached their way behind us. The spinnakers of class 5 didn't stay up for long and we all settled in to a close company reach to Warner. There was much excitement when one of the refinery tugs came past pushing an enormous bow wave such that we managed to catch a couple of very fast surfs as she went past. The longest and fastest registered us at over 12 knots. As the wave progressed over to the Island we heard much hooting and hollering as Alchemist caught the waves as well and zoomed along at great speed for a time. Closing the Fort we slowed to let Xara head up to windward much further than we wished to go as we were to windward of her. Whistler did it the polite way shortly after by anticipation the close encounter and crossing our stern. We changed to #3 just before the mark anticipating close hauled work from there to the finish. At Warner the fleet was still close and most headed straight for Browndown between the Forts. We clocked Alchemist going for the initial high route to the Island side of NomansLand fort and decided this was a good tactic to cheat some of the tide and followed suit then driving for Browndown once by Ryde Sands post. Again once at Browndown the fleet were still pretty much together apart from Domaine who had started to eke out some distance to the rest. From there to Cowes it was hard on the wind and waterline length in a decent blow started to tell. We started to drop back from the high raters ahead, dropped in a reef and struggled along. At Cowes it was short tacking initially into the back eddy off the Green then just staying close to the shore to reduce the adverse tide effect as we beat down the Western Solent. By Hurst the tide was fully with and as we were well behind the pace setters decided to go for the soft option of the North Channel and less bumpy stuff than the Needles Channel route even though we would lose out on tide. About two thirds across the bay we tacked out to try and get some of the better West going tide and then homed in on the finish. 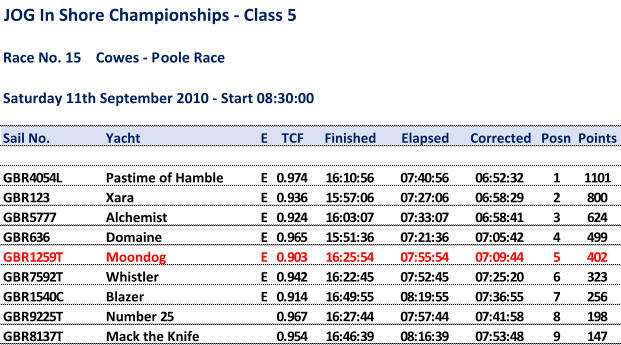 We were not expecting a good result out of this race and were quite pleased with a fifth and very much looking forward to the downwind return leg to finish off the inshore race series.